An upright, columnar shrub with bright orange foliage in summer. 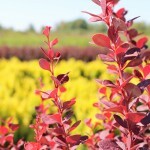 It later matures to an orangey-burgundy to ruby color in the fall. 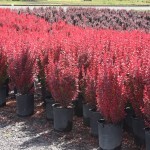 Use as a vertical element in containers, in the shrub border, or even as a unique hedge. The foliage color is best in full sun. It needs an average, well-drained soil. 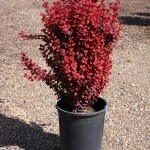 This plant is a cross of B. thunbergii 'aurea' and 'Helmond Pillar'. PP 18,411.